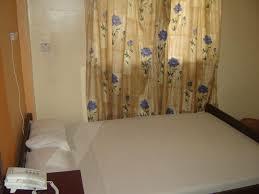 Safari Inn: a budget hotel that offers clean and comfortable accommodation and excellent value for the customer. Referred to by many as being safe and secure, it is located in the heart of Dar es Salaam in an area that is easily accessible from down-town Dar es Salaams, the nearby Zanzibar Ferry Terminal and several banks. With a Total of 40 rooms, 15 Singles and 25 Twin/Double rooms, all having unsuited bathrooms, (hot water Facility),Free Internet, Telephone call facility at the ground floor, travelers feel at home and comfortable to sort their paperwork before their onwards journey. Rooms being accommodative, with emphasis being cleanliness and providing good service at competitive rates for the traveler. They offer free Wi-Fi services, 24/7 open reception, soft drinks and water on sale, reliable taxi service and more.